There are certainly ways Zafehouse could work with multiple players, however, we've always seen it first and foremost as single-player experience. Another consideration is that, from a technical standpoint, adding multiplayer to any game that wasn't built from scratch to support it is extremely difficult and time-consuming. It would likely take 75-100% of the time it took to make Zafehouse Diaries 2 (around 16 months) to implement it in a way we think would add significant value. This doesn't even include time for thorough play-testing and QA. That said, we have a few ideas on how to expand the game so it feels more "connected". If we went ahead, it would take the form of a meta layer -- so tracking player progress across the globe and providing those stats via a website or in-game interface. Can you elaborate a bit about the male / female name problem? Currently I'm not seeing any issues when I generate a new custom character -- male and female names are correctly assigned. If you can provide steps I can follow to see the problem, I should be able to help. I think there's two issues here, both of which we can (or have) addressed in Zafehouse Diaries 2! First of all, there's a quirk with the photo filter in Fear Equation that means it doesn't always treat the colours in images correctly, resulting in the lower quality you're likely noticing. It also adds some dithering to the image, to reduce banding and help users who don't always import high-resolution photos. That said, the dithering can make good photos look worse. We've fixed both of these in Zafehouse Diaries 2; the filter is nearly identical code-wise to the one in the original Zafehouse. Secondly, since Deadnaut, we actually resize (and pad non-power-of-two) imported images, and compress them to a GPU-friendly format, to ease the burden on the graphics card, though the size in both Deadnaut and Fear Equation is capped at 256 x 256. We've boosted this resolution to 1024 x 1024 for Zafehouse Diaries 2, which is more than sufficient for the sizes you see them in game. However, if you're not happy with the filter in Zafehouse Diaries 2, we're more than happy to add an option to disable it. Good news Zafehouse fans! 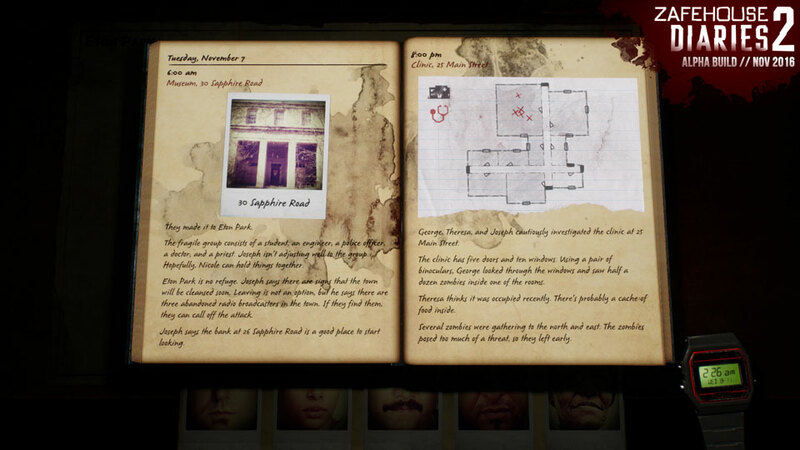 We've released a technical demo for Zafehouse Diaries 2, which you can download right now. For more information, please visit the official post in the newly-minted Zafehouse Diaries 2 forum! Zafehouse Diaries is back! But, before we start our journey into a new, zombie-encrusted narrative, we need your help to test the technical aspects of the game. Update: Massive thanks to everyone who helped us with the tech demo. With the game coming out soon, we've removed the tech demo links. Stay tuned! So, we're releasing special demo builds of Zafehouse Diaries 2 for Windows and Mac to make sure the game runs correctly on as many systems as possible. As such, we're only really looking for feedback regarding problems with graphics, audio, input and anything else related to actually running the game. Please note the demo is not representative of the final game -- there's still a few bits and pieces we're adding before the full release. CPU, video card, amount of RAM, operating system and version (including service packs) and display resolution. The game will end after 3 days of in-game time. Limited to 3 survivors (custom or random). 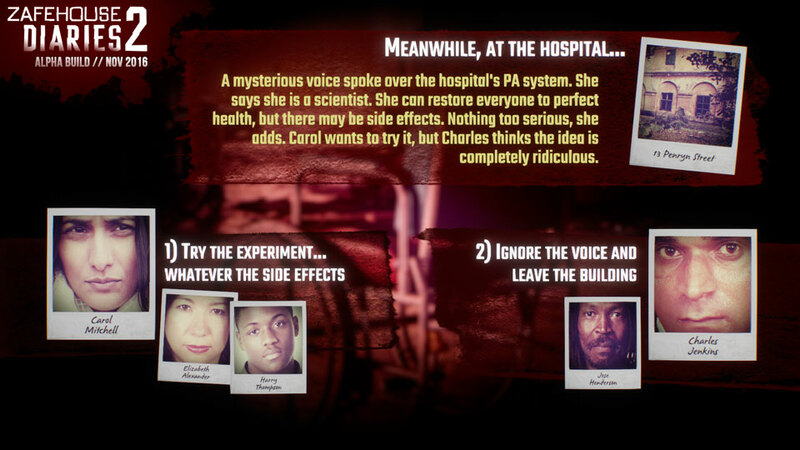 Only the tutorial scenario, "Safe As Houses", is available. Some dilemmas, events and modifiers disabled. Please post any feedback in this thread, rather than the official technical support board. If possible, let us know any information you feel is relevant (graphics drivers, hardware configuration, distribution etc.). If you'd like to contact us directly, email logan@screwflystudios.com for technical queries, and contact@screwflystudios.com with general questions. Zafehouse Diaries / Announcing Zafehouse Diaries 2! Zafehouse Diaries is back! The cult hit from 2012 is now bigger, better and more terrifying than ever. Take control of a group of people - each with their own skills, motivations and prejudices - and try to survive the zombie apocalypse. 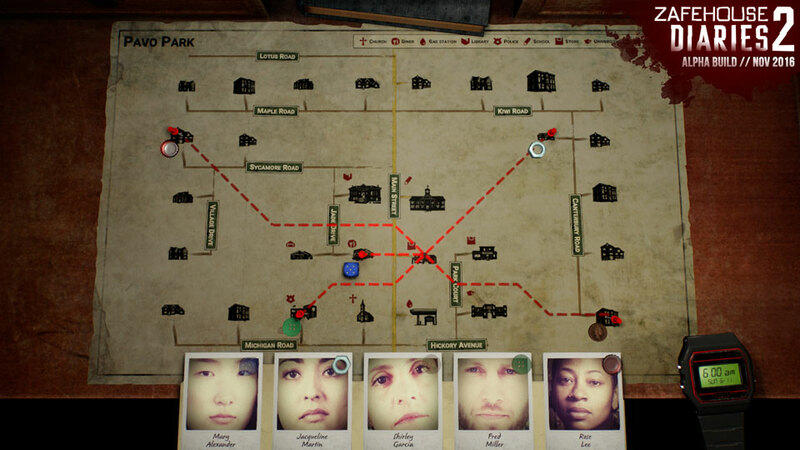 Every story is unique: Each game is procedurally generated - will your survivors work well together and complete their objectives? Ordinary people, extraordinary situations: Keep your survivors happy and motivated, or they'll turn on each other. All new engine: Zafehouse Diaries has been upgraded in every way. Full widescreen support, high resolution, a 3D environment and multi-platform support. More of everything: Loads of new items, orders, events, occupations, dilemmas and scenarios. Increased control: Equip your survivors and determine how they defend and breach locations. We've also refined the relationship system so you can have more ways to change survivor interactions. We've replaced the rumour system with redemptions - one survivor can do certain tasks to 'redeem' themselves in the eyes of another, which removes a prejudice. 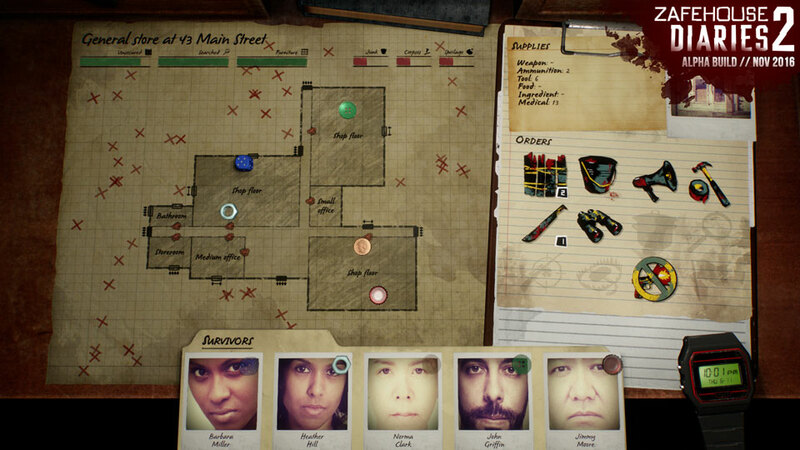 At its core, Zafehouse Diaries 2 is the same strategic drama simulator as the original, but it expands on it in every way: added content, upgraded engine, more surprises, more madness. Stay tuned for updates by following us on Twitter and Facebook, or visiting the official Zafehouse website. Fear Equation / [2.0.2] Linux version released! Fear Equation has been updated to version 2.0.2! This patch marks the release of the Linux version of the game. We've received a number of requests from players asking for a full, customised allotment of passengers and as of 2.0.2, this is now possible! The custom game screen has been tweaked to support up to 150 player-made passengers. Added: Fear Equation is now available on Linux. Please note the game is only officially supported on Ubuntu 12.04. Added: It is now possible to have up to 150 custom passengers. The passenger tabs have been replaced with a list that can be sorted by name, occupation and priority. Added: (Steam only) Five new achievements based on Wanderer interactions. Fixed: A typo in the beacon report. Fixed: An issue with Wanderers as carriage leaders. Fixed: An issue with passengers being killed while attacking a Wanderer. Performance: Optimisations to SMAA (anti-aliasing). Performance: Small optimisation to bloom effect. Sorry you've had issues with the patcher -- it looks like the Humble Bundle version of the game didn't receive some of our later updates. We're fixing this with them now. Greetings fellow commanders, Deadnaut has just been patched to v1.3.1! We've been tinkering under the hood of Deadnaut and come up with a healthy batch of balance changes, fixes, optimisations and tweaks to make your experience in the depths of space even more doomed enjoyable! Balance: Ghosts enemies can no longer drag deadnauts. This fixes an issue where such enemies could drag characters into the void, resulting in them getting stuck. Balance: Hacking sentinels is now more effective (easier to hack, hacks last longer). Balance: Enemies can no longer hit each other with their own projectiles (blast weapons excluded). This matches the behaviour of deadnaut friendly fire. Balance: The amount of Knowledge stolen by the Siphon flaw has been reduced and capped. Balance: Mines are now significantly more effective, especially at higher gear levels, and take into account the wielder's combat skill. Balance: The image created by the projector now decays faster and takes more damage from all sources, however, the wielder's detection skill provides more of a benefit. Tweak: Stim use is now bound to the left ("[") and right ("]") bracket keys, representing the first and second slots respectively. Tweak: Deadnauts with melee primaries and ranged secondaries will now use their ranged weapons when appropriate. Tweak: Deadnauts with melee primaries, scanners and projectors no longer automatically shoot enemies unless they've been spotted or forced to attack. Tweak: Inter-mission exit game button now reads "Save & exit". Tweak: Grouped deadnauts are now smarter about spreading out work when a number of consecutive "Investigate" orders are given. Tweak: Grouped deadnauts will no longer wait for the best hacker to open a door if that hacker is far away. Fixed: End game debrief was reporting erroneous numbers for "Sentinels hacked". Fixed: An issue where the chat log would stop working. A side-effect of this change is that extremely large chat logs will have their oldest entries culled. Fixed: The Siphon flaw allowing a negative Knowledge balance. Fixed: A few issues when exiting the game. Fixed: The Selective Deafness flaw no longer allows deadnauts to open disabled (grey) doors. Fixed: Mines now once again apply critical hit effects. Fixed: Deadnauts will never attack hacked sentinels unless forced by the player. Fixed: A rare issue where saved games would fail to load. Fixed: Additional checks to make sure portals don't teleport deadnauts into the void. Performance: Updated SQLite library to 3.11. Performance: Game assemblies are now built with Microsoft's Roslyn compiler. Performance: Updated screen space ambient occlusion effect. Performance: Extensive optimisations to memory and CPU usage to reduce stuttering. Performance: Optimisations to sentinel AI to reduce stuttering in later levels. It is recommended you start a new game after updating, as saved games are not supported between versions. We've had the chance to do some limited testing on Linux, however, we'd like to gather some more technical feedback from users before we consider a full release. The game will end after 14 in-game days. Blockade game mode is disabled. Custom games, including customised engineers and passengers, is disabled. Saving and loading is disabled. Only five, non-randomised fear types from a significantly larger pool. While we're confident the game will run on a variety of Linux distributions, we can only officially support the game on Ubuntu 12.04. Whether you run into problems, or the game runs fine -- let us know either way! I've made a few tweaks the flaw that will stop it from making your KN balance go into the negative. The amount of knowledge it siphons has also been reduced and capped (it is based on a percentage of your current KN). FYI, I've incorporated these changes into the current development build. * First off, there was a bug with mines that prevented them applying critical effects (such as burning, confusion, etc). Seeing as that is the primary benefit of mines, this did indeed make them underpowered. In addition to fixing this bug, I've made them more effective by incorporate the user's combat skill. * Seeing as Deadnauts can't hit each other with their own laser / ballistic fire, it seems only fair the Enhanced/Evolved enemies can't hit each other either. This should fix the hologram exploit (as it were). * Holograms now decay faster and take significantly more damage. On the upside, I've increased the bonus provided by the operator. We will be releasing the changes we've made here to the retails builds on GOG, Steam, etc. We're just making sure they're actually fixed before we do so. Unity, the game engine we use, has its own internal settings for the game resolution. Those are the "screenmanager" entries you see. However, we've found Unity's application of these settings haphazard at best, so we override its normal behaviour with our own logic. Unfortunately, to make sure the game applies the custom settings you want, you'll have to set both entries to the same values. Regarding the sharpness issues -- that would sound like the game isn't running at your display's native resolution, so if you can tweak theses values to match, it would definitely help.